The earliest mention of St. Bibiana comes from an authentic, historical book, “Liber Pontificalis”, where, in the biography of Pope Simplicius, 468-483, it states that the body of a Roman Virgin and Martyr named Bibiana, was in a Basilica he consecrated. “Pope Simplicius consecrated a Basilica of the holy martyr Bibiana, in which, contained her body, near the palatium licinianum”. The Basilica of Santa Bibiana still exists today. This is really all we know for sure, the rest is based on tradition. 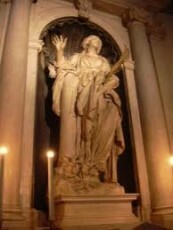 St. Bibiana suffered in the persecution started by Apronianus, Governor of Rome. She was the daughter of Christians, Flavian a Roman knight, and Dafrosa his wife. It is said that Flavian was tortured severely, and was sent into exile where he died from his wounds. His wife was beheaded, and their two daughters Bibiana and Demetria were stripped of their possessions and left to suffer. They did remain in their house, spending their time in prayer and fasting. It became apparent to Apronianus, that hunger and want had little effect on these two girls. He had them brought to him, and Demetria, after confessing her faith, fell dead at the feet of the tyrant. St. Bibiana was placed in the hands of a wicked woman called Rufina, for greater suffering. She tried to seduce her, using blows and beatings, as well as persuasion, but the Christian virgin remained faithful. Enraged, Apronianus ordered her to be tied to a pillar, beaten with scourges, laden with lead plummets, until she died. She endured the torments with joy, and died under the blows of her beating. We know that St. Bibiana was a martyr for her faith. Much of the details are left to tradition, but we know she was a martyr and saint of the early Church. It is said her father was beaten and exiled, where he died of his wounds. Her mother was beheaded, and she and her sister were left to die in their home with no means to survive. Refusing to give up her faith, she was beaten to death. Many of the early saints of our Church went to heroic ends to maintain their faith, and her life was no exception. We owe our faith to these wonderful saints who held fast to their faith so we may grow in ours.